I scoot back down the mountain, and shelter in San Diego at home... because this is what I am not equipped for. Speaking of being equipped, I hope a lot of hikers out there that are attempting this are well-equipped for winter weather in these mountains just behind Los Angeles. There's so much chatter and emphasis and esteem points these days on ultralight gear and not carrying anything but the bare basics--and the bare basics for backpacking three days through even six inches of snow and freezing temperatures means quite a bit more gear and ounces than the gear needed for a summer stroll in the Sierra. Sure, you don't need powder baskets and crampons/spikes and decent snow gloves and a midlayer shirt and leggings and a warm sleeping bag and pad... until you need them. So after writing the previous blog post, I dropped back to sleep, and woke up around 8am and went down to the lobby for the hot breakfast. It was pretty good, and I ran into Pacman and Haiku and Days Late all chatting away... and I darkened their days by mentioning the weather. eTrain had already left and headed up the trail at 7:30; I got his text when I turned on my phone at breakfast. I decided to chat everyone up about my plans, and the hotel housekeeper (with her manager's approval!) offered to drive me the 25 minutes down the hill into Ontario--the staff at the Best Western Cajon Pass were wonderful; I'm greatly appreciative. But it's Sunday, Easter Sunday, and the Metrolink train schedules are pretty infrequent. Hmmm, what about a rental car? Grrr, Sunday, nothing's open. But wait, Ontario has a largish airport! 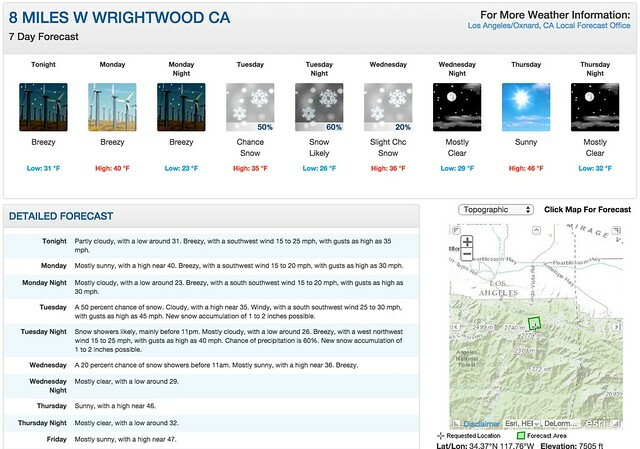 Hmmmm, yeah that works, and I can rationalize a one-way rental easily; that one-way rental may seem expensive but it'll cost less than sheltering in a Wrightwood motel for two nights or three; snow might stop falling by Wednesday but that doesn't mean it's safe or pleasant to hike through. So I called up Enterprise Car Rental, got a one-way reservation to San Diego... at 10:45 I was on the road heading south on I-15. 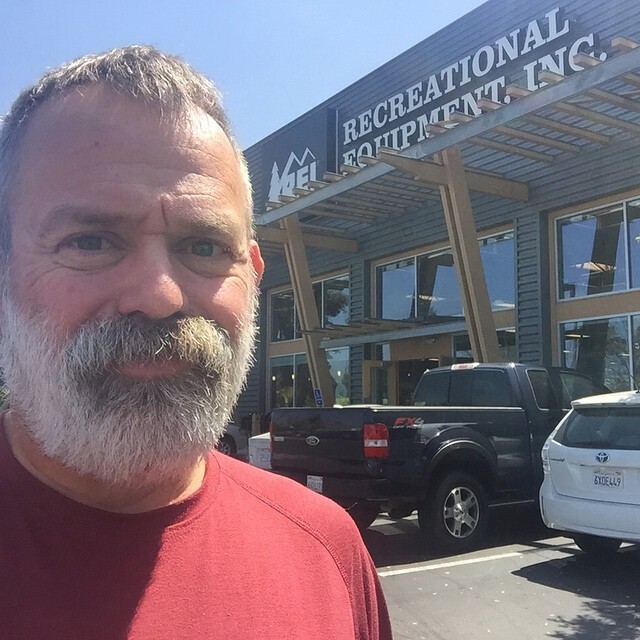 At 12:30 I was pulling into REI San Diego to see about that replacement for my slowly leaking Thermrest sleeping pad (another reason I wasn't too keen on camping in the below-freezing cold.) I decided on a Sea To Summit Comfort Plus Ultralight Insulated this time; it weighs a few ounces more (3 to be precise)and is a few inches longer... and doesn't make crinkling noise when you shift around at night. I got back home, started a load of laundry, and napped a little bit. These next few days I don't really want to get mentally off the trail, so I'll complete writing a few draft blog posts for a few missing days (I generally write for about 15 minutes every night, dig through pictures to see what I've missed, update the blog post based on the pictures, then publish... but sometimes I'm just too tired to do anything but make dinner and take care of my feet and then sleep. I should also watch out for a few things surrounded by these home comforts--for one thing, I can't really eat like I do when I'm hiking 20 miles a day as much as I might want to. I also should keep up some walking in the next couple of days before I jump back on the PCT in Acton. I'll start with walking back home from the San Diego Airport after dropping off the car rental in the morning. It's only 4 miles away... that should take me around 90 minutes to walk back. And I want keep all my gear in semi-isolation; I don't want to co-mingle the trail stuff with the everyday stuff and miss something when repacking. Speaking of gear and stuff, I should really do a blog post on 'what worked and what didn't' for the last 20 days and 312 miles of the PCT I've hiked so far, to mile 341. Sounds like a blog post to ruminate on tonight.